If you want to look ladylike and sweet this winter, then I recommend wearing pastel outfits. In today’s article, we are going to see awesome ways how to wear pastel color garments in your everyday life. Believe me, these cheerful outfits completed with fun pastel hues gonna make you look ladylike and trendy. Read on to see how to make pastel outfits look awesome on you this winter. Would love to hear your thoughts in the comments below. If the weather is really cold outside, then the best way is to wear a pastel-colored coat. 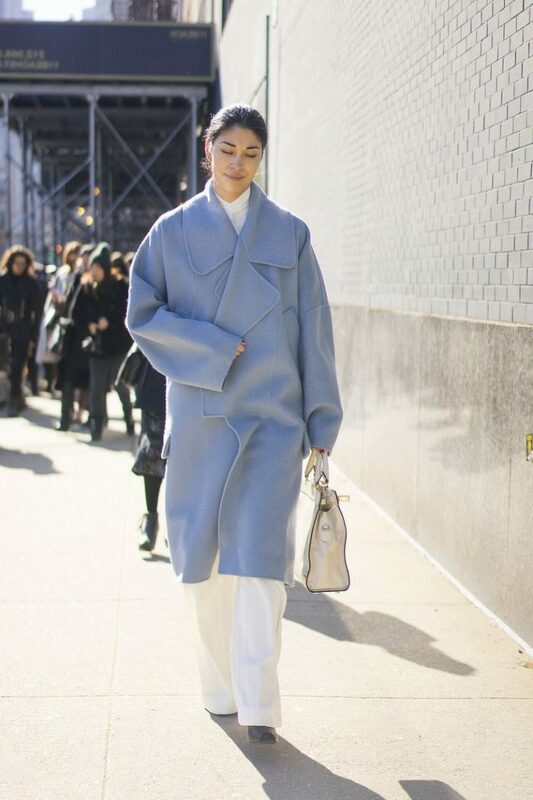 For instance, you can go for a pastel blue shapeless coat and pair it with black ankle-length boots, black tights, black beanie and a printed bag or keep things sophisticated by wearing a blush maxi wool coat atop white monochrome separates. The soft shade gonna add a feminine twist to your boring outfit. If you want to underline your individuality, then I recommend to mix and match your favorite pastel shades. Go crazy with mix and match by teaming together various pastel hue garments. For example, you can go for a pastel turquoise coat and style it with blush top tucked in pastel violet skirt. Believe me, this update gonna make you look angelic and sweet-looking. If you want to make things look more creative, then how about wearing pastels with printed garments? For example, you can wear blush jacket atop cute floral print sweater teamed with high-rise dark blue jeans completed with pointed-toe white pumps. Another great way to make your outfit look ideal during cold Winter days is to get your hands on pastel furs. Believe me, this is one of the best ways to look chic this cold season. I love to see ladies who appear on the streets wearing blush colored fur coats styled with black monochrome separates. If you still don’t know if you want to look mannish or girlish, then the best way is to add a tough vibe to your sweet look. All you need is to wear an edgy piece colored in a pastel color. For instance, you can try on pastel blue leather jacket and pair it with black separates. If you are a beginner to this trend, then why don’t you start from pastel accessories. This cute looking shade on a pretty accessory will always make you look sweet and feminine. Do You have any thoughts about Pastel Clothes For Women To Try This Winter? Here are Fashion Tips pictures and trendy women’s outfits which are in style in 2019: Fashion Color Trends Report For Women, Must Have Fashion Trends For Women, Pastel Accessories, Pastel Biker Jackets, Pastel Clothes For Women, Pastel Coats, Pastel Fur, Pastel Mix And Match, Pastel Prints For Women, Street Style Women's Fashion And Inspiration and tips on how to wear them on the streets.